The Chinese Massacre (Annotated) must have looked great on paper: Circle X is a well admired and award-winning theatre company, and Tom Jacobson (Bunbury, The Twentieth Century Way) is one of the best playwrights L.A. has. Combine that with a little known story of early Los Angeles mob violence, and the excitement of the show being Circle X&apos;s first full production in its new permanent home at the Atwater Village Theatre, and expectations were suitably high. The result, unfortunately, is an admirable misfire. The writing doesn’t lack for ambition or scholarship, but it stretches itself too thin trying to cover a gargantuan gallimaufry of history and culture and people. Jeff Liu&apos;s direction quickly becomes a traffic jam, a confusing morass of actors switching in and out of roles and yelling over each other, and, with a few exceptions, the acting itself is muted and unremarkable. The story begins in 1891, when a mysterious visitor meets with old Reverend Crenshaw (Silas Weir Mitchell) about buying an unusual object for sale—a severed finger. Queries concerning the provenance of the digit start Crenshaw telling the tale, which takes place twenty years earlier. Lee Tong (West Liang) is marrying ex-prostitute Yut Ho (Elizabeth Ho) so as to transfer her ownership to the Hong Chow Company, under the manipulation of Yo Hing (Ryun Yu). Gene (Yu), Lee&apos;s doctor older brother, warns his sibling that he&apos;s being taken advantage of, but Lee likes the money Hing gave him and is enamored with his bride. Trouble arrives when Lee uses a gun to defend his wife, and a confused racist mob arises, ending up with the lynching of 18 Asian men. One of the problems with the performances is that the dialogue sounds more like historical background shoehorned into the play than actual conversation, which feels inauthentic and takes the place of much character development. Another is that most actors play several roles—sometimes in the same scene—not always changing costumes or doing much different with voice or physicality. This often makes it difficult to tell what person a given actor is playing at any particular moment. Compounding that, multiple foreign accents are used, as well as dialogue in multiple languages that isn’t translated, effectively building a theatrical tower of Babel. This may have been a deliberate choice on the part of the playwright, but it makes the experience frustratingly opaque. Neither Liang or Ho are convincing in their portrayals, and this causes a dead spot in the center of the play, which should be its heart. Mitchell, generally a fine actor in other roles, gives a one-note performance as the racist thug Crenshaw, but to be fair, that’s how the part is written. Yu stands out as the intelligent Gene and the villainous Yo Hing, and Jully Lee is bracingly astringent as Gene’s bluntly honest wife Tong Yu. Finally, Lisa Tharps is excellent as ex-slave and businesswoman Biddy Mason, so fully formed in performance that one wishes there were another play focusing on her fascinating story. 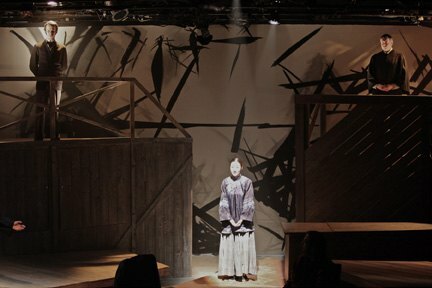 Liu’s direction needs tighter focus, both in staging and in the performances of the ensemble. I’m not unsympathetic to the inherent challenges of this piece, but the direction has to keep all the elements of this very complicated play clear to the audience, or the multiplicity of balls the playwright is juggling tumble awkwardly to the ground. Jacobson has a character point out early on that this show is using Brechtian distancing techniques, such as actors stepping out of character to deliver “annotations” directly to the audience, to appeal to the intellect rather than the emotions. I think the effect he&apos;s going for is that we’ll feel the extent of the tragedy by the end of the play, regardless of this sober style and advice, but ironically we are alienated anyway by the overflow of information and the inexactitude of its delivery. The Chinese Massacre (Annotated) is not a bad play, but it might benefit from revision, because in its current incarnation, it doesn’t quite work. The Chinese Massacre (Annotated) runs through May 28 at the Atwater Village Theatre. Tickets $25 via phone at (323) 644-1929 or online.